Antiles swimming butterfly at a Columbia University meet. 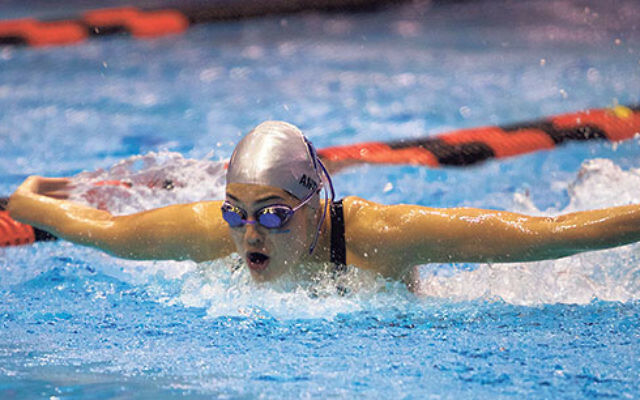 Jessica Antiles of South Orange stood behind the block at the Olympic swimming trials in Omaha, Neb., on June 26, and closed her eyes, visualizing herself doing her best. She repeated her mantra, “Try 100 percent. The rest is up to God.” Then, she got up on the block, took her mark, dove into the water, and swam. In the end, her time was disappointing. But the experience was exhilarating. “I was in the locker room with Missy Franklin!” she gushed, over iced coffee in South Orange with an NJJN reporter on a recent afternoon. “I was standing next to Michael Phelps and Ryan Lochte!” All three have achieved celebrity status in the sport, having won multiple Olympic medals. Antiles, 19, a graduate of Golda Och Academy in West Orange and a member of the Maplewood Jewish Center where her father is president, qualified for the Olympic trials two summers ago while swimming with a club team in Israel, for the 400-meter long course individual medley (two laps each of butterfly, backstroke, breaststroke, and freestyle). That day, she shaved 3.5 seconds off her best time. Managing to keep things in perspective, she focused on the experience instead of her finishing time. Antiles, a rising sophomore at Columbia University, where she was the only woman, along with three men, to make the Olympic trials, started her swimming career at the Leon and Toby Cooperman JCC in West Orange at the age of six. 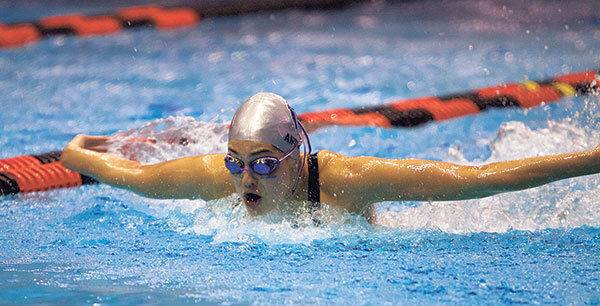 She won every race she was in — until she moved onto the Montclair Cougar Aquatics club team when she turned eight. When she didn’t win every race, it made her work harder. That intensity and the desire to give everything she has to whatever she does are what moves her forward. But she’s also learned that she can only control her own effort. It’s a lesson she learned at least in part from her parents, Janette and Seth Antiles, who were also college athletes. Both played tennis at Columbia. Her mother is the first women’s tennis player in Columbia University history to earn All-Ivy recognition, and remains one of two women to have ever done so. The family belongs to Maplewood Jewish Center, where Seth is president. Antiles swam and played soccer until she was 12, and then she knew she had to make a choice. “I hated sweating, and I loved being in the water,” she said. Ironically, she pointed out, she sweats all the time during land training, which includes weight lifting, as well as when she gets out of the pool from the exertion. At club events, Antiles swam the 200 IM, the 400 IM, 100 freestyle, 200 freestyle, and 500 freestyle; in the college league, she is allowed to swim three events: 200 and 400 IM, and a third event that shifts around from meet to meet. One month into Neshama, Golda Och’s Israel trip for second-semester seniors, Antiles first came down with the sinusitis that would dog her at the trials. She was swimming with the club team in Israel she had tested out the previous summer, when she qualified for the Olympic trials. “I didn’t feel good. I couldn’t breathe and I had a headache all the time,” she said. When it was finally diagnosed, she learned she would need surgery. But she had enough time to do it over the summer so that it wouldn’t interfere with her first year at Columbia. But halfway through her freshman year, she got sick again. She was able to put off the second surgery until after the major meets of the year. But that meant she would be recovering and unable to swim in the weeks leading up to the Olympic trials. Now, she said, she’s added her own twist. “This challenge was put there for a reason. It’s a test, to see how I would handle it, to make me grow,” she said.